Veteran rock band Fall Out Boy’s seventh studio album, delayed for four months after their bassist Pete Wentz explicitly admitted the songs weren’t good enough in an interview, is certainly a lot more impressive than I’m sure most people expected. However, as evidenced by opening EDM misfire “Young & Menace” remaining on the project, M A N I A is still inconsistent and directionless at times. But standing at only 10 tracks, there is not much room for filler, and Patrick Stump’s trademark vocals and the band’s dedication to heavier instrumentals are still as powerful as they’ve ever been. It appears that Fall Out Boy was at least partially inspired by labelmate Paramore’s transition into retro-pop on their fantastic After Laughter, offering some similar tropical pop chords infused with their trademark style of guitar riffs on “HOLD ME TIGHT OR DON’T”. The effect of someone with a voice as commanding as Stump’s transitioning to a more modern instrumental is quite powerful – he hits some huge notes in the chorus, bringing the stadium rock anthem into a new era. As the tribal drums hit in the track’s bridge and he holds that note on the final “knife” to his voice’s breaking point, I can already picture the scores of crowds singing along to that final chorus. “The Last Of The Real Ones” brings frequent Weeknd collaborator Illangelo on board, and the track evokes the same kind of indescribable dark energy that a song like “The Hills” has. I give credit to the band for still sticking fast to emphasis on the musicality of the band, actual instruments (especially that impressive drum work!) 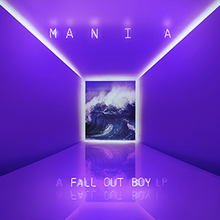 prominent on every song here where most rock bands turn to more produced pop beats and synths – where this would frequently sound dated, Fall Out Boy bring just enough modern elements in to keep the classic idea of the heavier rock band at the forefront of pop culture alive. The back to back tracks “Church” and “Heaven’s Gate” might be the band’s best work in years, Stump channelling every ounce of soul in his voice for some more R&B influenced tracks. The latter especially features a beautiful doo-wop instrumental and Stump harmonizing with himself on some seriously impressive high notes before giving the chorus everything he has, showing restraint and emotional vulnerability at just the right moments. There are certainly some lyrical shortcomings on the project that bring you out of the songs for a second – especially when comparing the group to the work of some fellow surviving bands lumped together under that “emo” umbrella from the mid-2000s. Where many have grown up in their lyrical themes, there’s something a little weird about hearing a 33-year old structure a chorus around the lyric “I’ll stop wearing black when they make a darker colour” on “Wilson (Expensive Mistakes)”. Adding a few awkwardly shoehorned pop-cultural references into the mix only exacerbates this – especially when they’re as poorly timed as their villainizing of Tonya Harding on “Stay Frosty Royal Milk Tea”. The juxtaposition of that track with preceding “Champion” is noticeable for the repetition of the same tired tropes of self-empowerment they already had a big hit with in “Centuries”. They do know what they’re doing though – “Champion” is much less contrived than the former, and when everything collides together at the end it is legitimately an electrifying experience despite being derivative. Stump still possesses a live wire of a voice that can break through the mediocrity. The project can’t seem to settle on a concrete direction either, jumping between dance-inspired electronic guitar effects, finger-snap poppier tracks, and even a strange feature from Nigerian artist Burna Boy that attempts to jump on the dancehall trend. The project is at its best when Fall Out Boy adhere to what got them here in the first place, making it less blatantly obvious that they’re trying to fit in when they incorporate some more modern pop trends on tracks like “HOLD ME TIGHT OR DON’T”. Still, even on such an inconsistent project, you have to give the band credit for sticking to their guns as much as they do, still capable of making some pretty great music even as the modern pop landscape starts to pass them by.